Beginning my first assignment was daunting, I was full of worries about not really being good enough for the course, and whether I had what it takes, the usual lack of confidence I suppose. getting into the ‘groove’ and my lines were more confident and accurate. For my first assignment, I was to draw an outline of a plant or flower as if I were preparing a watercolour, stipple a flower with leaf in pen and ink, and produce a complete study in continuous tone. I chose a lily for the first part, since they tend to last a long time and I didn’t want to be worrying about the flower wilting as I worked. I’m glad I used this, as there was plenty of opportunity to draw perspective. The second part, Stippling, I drew a Tulip. After many practise pieces, I discovered that whilst the stippling was going well, the outlining of the Tulip was nowhere near confident enough. There was always a slight mistake which spoiled the whole thing. By now I was getting nervous, time was moving on, and if I wasn’t careful, there would be no time to do a good continuous tone drawing. In desperation, I decided to forget the outline and just use Stippling to describe the outline as well as the shading. I just hoped that my tutor, the Course Director, Margaret Stevens, would accept it and not penalise me for a lack of outline. It took about 40 hours altogether to complete the stippling, but I was pleased with the effect and felt that I would be happy to send it off. On to the Continuous tone. After a few false starts, I settled on a piece of Ivy which my Husband had found amongst hedge clippings on his travels. It had such an interesting texture and form and would give plenty of practise for rendering tone. Working in Graphite was interesting, I had to be very careful not to smudge the work already done. I hadn’t thought that this would be a problem as I had done a lot of Soft Pastel work in larger sizes and never worried about smudging, but working in graphite is so different, you are working much closer to the paper. So I made good use of my cheap draughting paper to protect the work. After a week of work and much use of my soft putty eraser, the drawing was complete and I could label the backs of all my work. Just in time too, as the deadline for posting had arrived. Two months had flashed past in next to no time. The wait for my work to be returned seemed endless, but in reality I received my work and Assessment sheet back in a very short time. 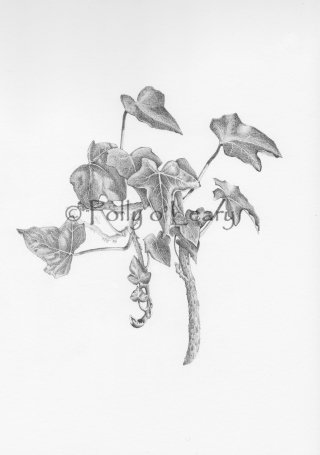 Not only had I received a very good mark, but Margaret Stevens requested both my Stippled Tulip and Graphite Ivy for the Student section of the SBA Exhibition 2013! I’m still pinching myself about this, and will only believe it when I see it in April at the exhibition. Must remember to take a Photo of me with my work on the wall, it’s the first time I’ve ever had work in an exhibition, only the student section but it’s a start.